Our Laser Tattoo System uses a safe, high-powered laser to remove tattoos and pigmented lesions (sun spots, freckles, etc.) by emitting a highly focused beam of laser light directed at the tattoo. The laser light passes harmlessly through the outer skin layer and is absorbed by the tattoo ink or excess pigment within the lesion. The light is quickly converted to heat as it is absorbed. The sudden rise in temperature fractures the ink or pigment into tiny particles. 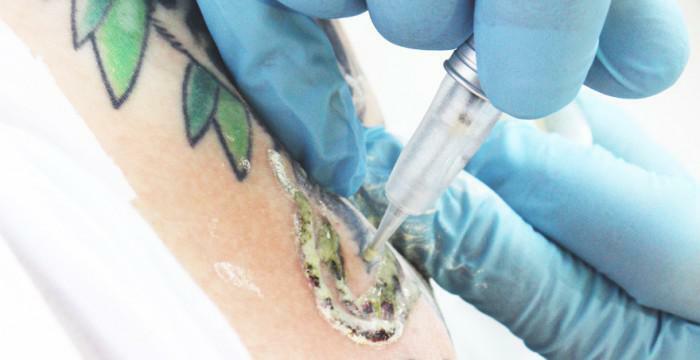 Tattoo ink fragments are then carried away by the lymphatic system and pigmented lesions are naturally shed from the skin one to two weeks after treatment. A tattoo’s color, depth, and chemical composition of the ink all affect how it responds to the tattoo removal laser light. Tattoos that are black, red, dark orange and dark blue will usually respond relatively quickly to laser treatment. Tattoos of green, purple, brown, light orange, and light blue colors may require more treatments. In general, most tattoos can be successfully treated, with Laser Tattoo Removal, given a sufficient number of treatments. A wide range of pigmented lesions can also be treated with Laser Tattoo Removal including freckles, sun spots and many brown-colored birthmarks. Since the laser light selectively targets the undesired ink or pigment, surrounding tissues remain largely unaffected; therefore most patients report little discomfort. Many people compare the sensation of the pulses of Laser Tattoo Removal to the snap of a rubber band. If these ”snaps” are too uncomfortable, Lasting Looks Clinic can suggest using topical anesthesia, but this is usually not necessary. Are there alternative tattoo removal treatments available? For tattoo removal, laser treatment is the only effective method that is unlikely to cause any scarring. Alternatives to laser tattoo removal include surgical excision, non- laser tattoo removal, calibration (using salt to burn away layers of skin), and chemical peels (using acid to burn away layers of skin). Some of these methods can cause scars and can also be painful. 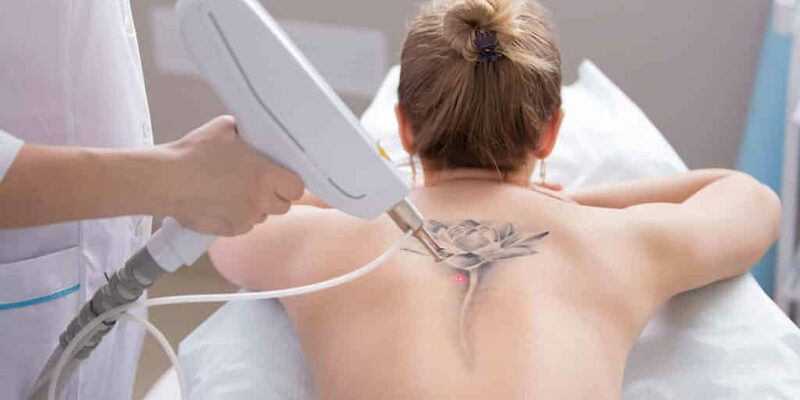 Our Laser Tattoo Removal System provides state-of-the-art treatment that yields excellent results without the perils and disadvantages of other procedures. What happens after a Tattoo Removal treatment? Immediately after laser exposure the treated areas may become whitish-coloured and swell slightly; this is normal and will subside in about 30 minutes. The swelling may last longer, but can be reduced by cooling the skin with an ice pack. The tattoo or pigmented lesion will fade over the next few weeks. How long does the laser tattoo removal procedure take? Depending on the size and location of the tattoo or lesion, each laser tattoo removal treatment usually takes about 10 to 30 minutes. Some faint tattoos and pigmented lesions will fade completely after only one treatment, though most may require 5 treatments or more. Treatments are spaced 6 to 8 weeks apart to give your body sufficient time to fully eliminate loosened particles of ink or pigment. Are there any side effects to tattoo removal? Side effects are rare. When they do occur, they are usually mild and confined to the treatment area. With this latest technology, we can offer you a non-surgical, non-laser method of removing tattoos. Non-Laser Tattoo Removal utilizes a unique chemical extraction process to soften the tattoo pigment that will gradually bring it to the skin surface. This method is non-color selective (applicable to all tattoo colors), and effective. Usually 1 to 2 treatments are needed for the removal of Permanent Makeup; however, more treatments are needed for body tattoo removal. The treated area will initially experience erythema (redness), which will gradually diminish, leaving the skin perfectly normal. The vast majority of tattoos fall between $200 and $350 per session. Pricing will vary depending on the size. Pricing is based on the size of the tattoo, colors and detail in the tattoo. Each tattoo is unique in its nature therefore a personal consultation is required. Lasting Looks Clinic also offers discounts on packages for multiple tattoos. Ms. Regan has over 18 years of experience with tattoos, both in the application and in the removal of them. Ms. Regan is not only a Certified Medical Tattooist and Laser Technician but she also specializes in Micropigmentation, Camouflage, Areola Restoration, Laser and non-Laser Tattoo Removal. Ms. Regan understands the complexity and the chemical composition of a tattoo, and how they interact in the dermal layers of the skin along with the application of them. With this type of experience you can rest assured that you will be receiving the utmost professional and latest medically approved procedure. There is a $25.00 consultation fee. This fee will be applied to your first treatment, should you proceed with the Tattoo Removal treatment.